Rock Maker 3.1 is the subsequent general release to Rock Maker 2.9, as Rock Maker 3.0 was only released on a limited basis. 3.1 is a big step away from 2.9, however, so if you have no upgraded since 2.9 it is strongly recommended that you read the Rock Maker 3.0 what's new content (below) and watch the introductory video. Rock Maker 3.1 offers many small, but significant usability enhancements over Rock Maker 3.0, which was released in a limited fashion to customers willing to move to the first iteration of Rock Maker’s redesign. For those of you upgrading from Rock Maker 2.9, be sure to read through both the 3.0 and 3.1 what’s new summaries, and make sure to watch the 3.0 introduction video on our website. Multi-Select in the Explorer. Due to popular demand, Rock Maker 3.1 features multi-select in the explorer, a.k.a. “tree”. 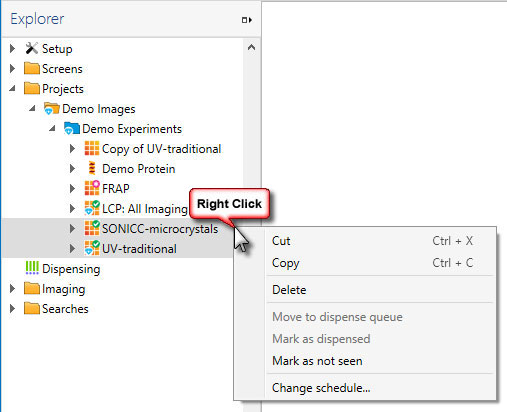 Press the CTRL key and click on different experiments, then drag them to a different folder or right-click to reveal commands that apply to each selected item, such as copy, delete, move to dispense queue, mark as dispensed, mark as not seen, and change schedule.Example of selecting three items and right-clicking on the Explorer. New icons in the Explorer. To make the Explorer look cleaner and start to match the rest of our software's look and feel, we've changed the icons. You can see the new plate state icons here. See experiments that contain hits from the Explorer. 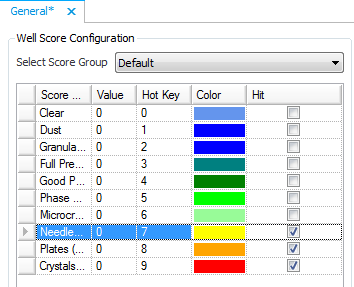 You can now configure which scores indicate a crystal hit when setting up scores, and then Rock Maker will automatically display a special symbol on the plate, experiment, or folder when a plate contains a drop that has been scored as a hit: . Easier-to-use Stock Selector. 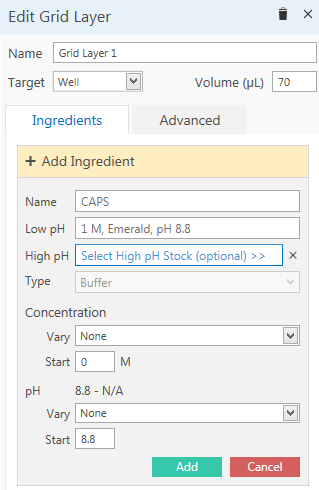 The stock selector has been redesigned so that selecting low pH and high pH buffer stocks is a more obvious process. The current field is also indicated with a blue highlight.New stock selector. Rename and Delete Screen Experiment Wizard templates. Template management has been improved in Rock Maker 3.1. You can now rename and delete templates through a right-click menu available in the template list. Score Report. Looking for an easy way to get an experiment’s scores into your lab notebook? Now Rock Maker can generate a score report from your scored drops. The report is a .csv file that contains every score assigned to each drop in your experiment.Export Scores button on the Reports tab. Required Stocks List. Want to see a list of every stock included in a plate at once? Now you can. Click the Required Stocks button in the Info group on the View tab.